If you were at Becoming, you might have noticed that the Chevron Infinity Scarf sold out quickly due to popular demand! If you were not able to get one or could not make it to Becoming, then this deal is for you! 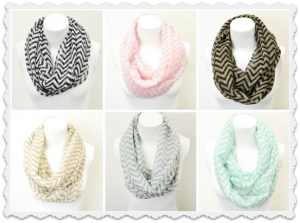 Cents of Style is offering the Chevron Infinity Scarf for $7.95 shipped when you use coupon code BECOMINGSCARF. You will also receive a FREE Becoming necklace, a custom piece made just for Becoming, while supplies last. These scarves are regularly $26, so this a great deal! They come in (6) different colors and are lightweight, perfect for any season to dress up an outfit with some extra flare! The deal ends 9/1. Shipping is FREE.